Hi little guys! Aren’t you fun! 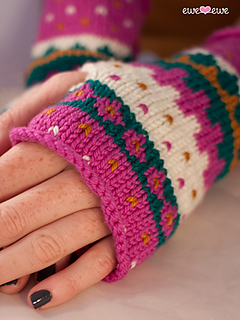 Work these wrist warmers up in your favorite four colors and you’ll end up wearing them all season long, or even longer! My hands always need a little hug so I wear mine on foggy mornings the year round. 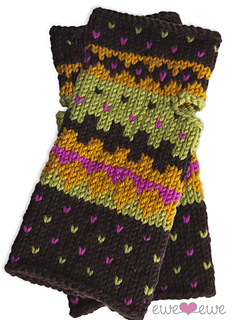 Plus working a little Fair Isle always keeps your knitting interesting. I love adding splashes of color here and there. A little pink for me, please!